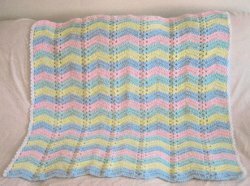 If you love pastel colors, you'll love this afghan. It incorporates great pastel hues. Make this simple crochet afghan for yourself or as a gift. 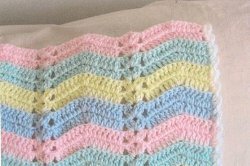 The Roseanna Beck Pastel Single Shell Ripple Afghan is easy to make with these instructions. Note: Work all rows in back loop. dc in each of next 6 ch, repeat from * across, turn. Row 2: Ch 3, skip 1 dc, dc in each of next 5 dc, 3 dc in next dc, dc in each of next 6 dc, *Shell in ch 1 space of Shell, skip 2 dc of Shell and next dc, dc in each of next 6 dc, 3 dc in next dc, dc in each of next 6 dc, repeat from * across, fasten off and turn. Row 3: Join maize in first stitch, ch 3, continue with Row 2, turn. Row 4: Ch 3 and repeat Row 2, fasten off and turn. With white working along both side edges (sc, ch 2, sc) in each dc across. It's a very pretty afghan. However, as other posters have mentioned, the instructions are not accurate. As written , the stitches do not line up vertically as shown in the photograph. Hi Maureen, For specific questions related to this pattern, we suggest contacting the pattern designer directly via her profile page. Thanks! I agree with the other posters....there's something wrong with this pattern. I'm coming up with too many dc left at the end of my row. Shell in Shell..this means crochet another shell in the "chain two space" of the previous row shell. I have started this afghan and have come upon a problem - I'm not sure what it means to "shell in Shell" and it also seems that as I continue on I have too many dc and do not end up back on top of my previous row 3dc. Please help as I am anxious to work on this afghan. I agree woth you. Something about these instructions isn't right and I can't figure out how to adjust them. I'm sorry bacause the afghan looks so pretty. Wow you are so talented I love everything you design but this is by far my favorite..Thank you so very much for sharing..